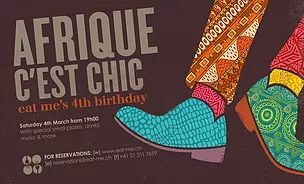 Join us to celebrate our 4th Birthday on Saturday March 4 starting 19h00! Time flies when you’re having fun… and we cannot believe it’s already been 4 years since we opened the doors to Eat Me! To celebrate, we’re hosting an exciting evening featuring the Best of Africa – food, drinks & music – all inspired by the colors, beauty & mystery of this magnificent continent. Or simply show up for the party in the bar/lounge! We have everything covered for a memorable night – great food, drinks, music & more! We look forward to seeing you all in a couple of weeks!